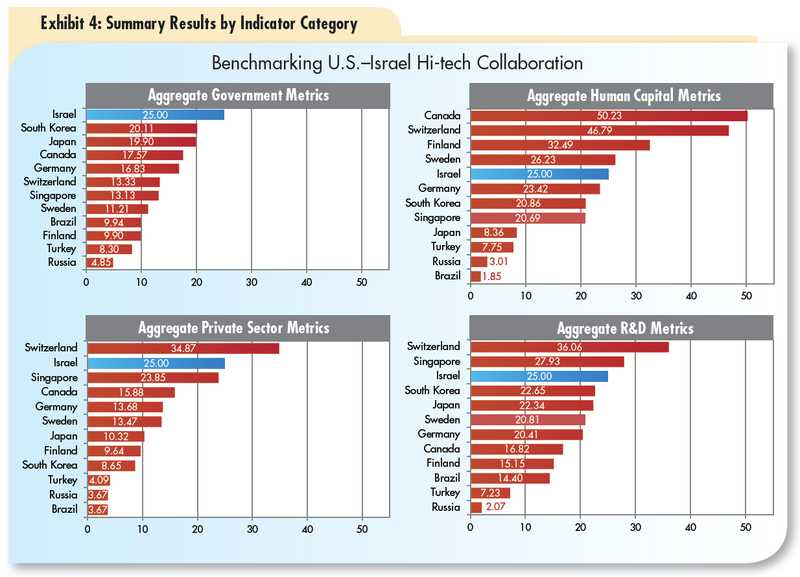 The U.S. – Israel Innovation Index (USI3) assesses innovation-related collaboration between the U.S. and Israel and compares and benchmarks that collaborative relationship to the linkages that exist between the U.S and a set of other innovation-inclined countries which, like Israel, possess important trade relationships with the U.S.
Government: Indicators measure and analyze the extent of government-to-government treaties, funding, and diplomatic linkages related to scientific and technological activity. 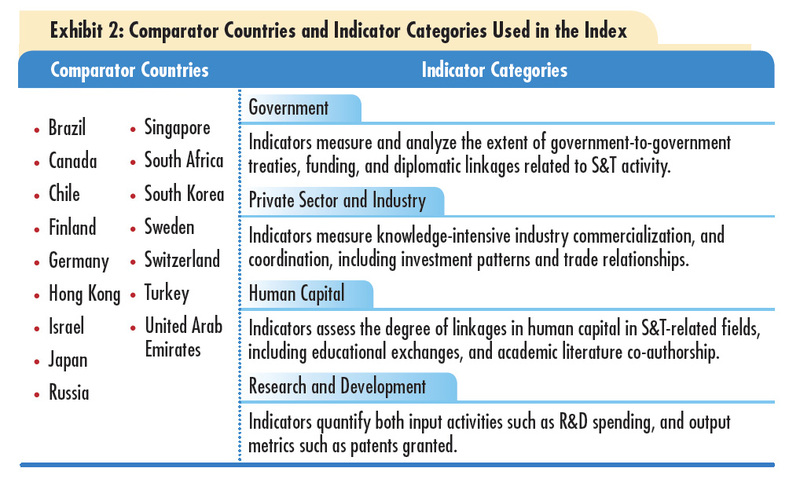 Private Sector & Industry: Indicators measure knowledge-intensive industry commercialization and coordination; including investment patterns and trade relationships. Human Capital: Indicators assess the degree of linkages in human capital in science and technology related fields; including educational exchanges and academic literature co-authorship. Research & Development (R&D): Indicators assess bilateral activities between the U.S and Israel quantifying both input activities such as R&D spending and output metrics such as co-patents granted. The USI3 Advisory Committee generously dedicated their time and expertise to support the development of the USI3. While they informed the USI3 development process, specific outcomes and conclusions may not reflect the positions of the individual Advisory Committee Members. Metrics measuring cooperation in innovation-related activities offer a picture of the benefits of U.S.-Israel science and research cooperation. The value of the relationship is highlighted and better understood through comparisons to similar cooperation between the United States and other innovation inclined countries. To this end, the USI3 benchmarks the U.S.-Israel relationship against that between the U.S. and other competitive countries including Switzerland, Sweden, Finland, Germany, South Korea, Singapore, United Arab Emirates, Brazil, Japan, Turkey, Russia, South Africa, Hong Kong, Canada, and Chile. It represents an original framework for evaluating bi-national scientific, technology, and business relationships that cross government, society, academia, and industry and provides a quantitative analysis that can be tracked year-on-year going forward. The U.S.–Israel Innovation Index provides a statistical foundation to understand the collaborative relationship among government, people, and industry in the hi-tech fields of science, technology, engineering, et al. 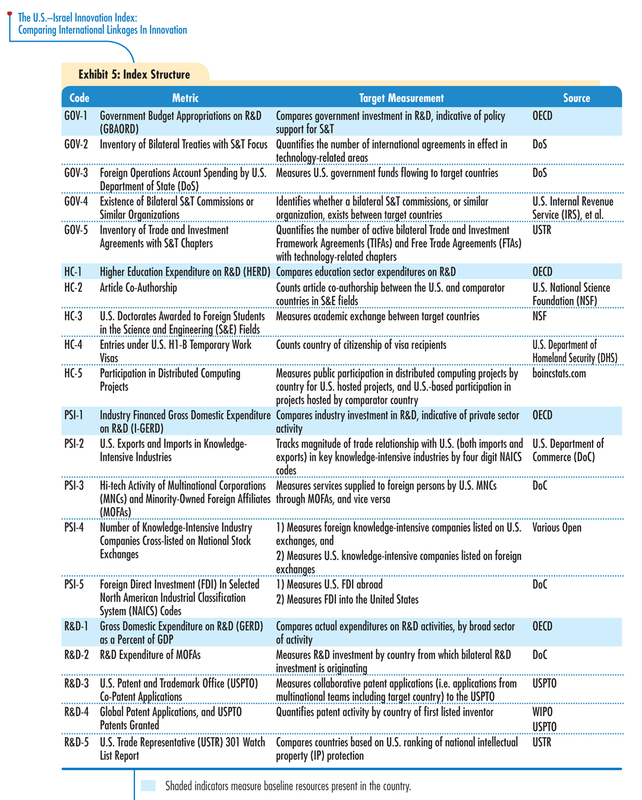 The Index focuses on understanding U.S.–Israel collaboration in innovation-related activity, and compares this to relationships the U.S. has with other nations. The scores presented characterize the relationship between the included countries and the United States. The data is indexed to the U.S.–Israel score. By definition, the U.S.–Israel score is set at 5 basis points per indicator, or 100 points total across the Index. In understanding the results of the Index, it is important to note that 100 basis points is not the maximum score on the Index. For individual indicators, relationships that are more concentrated than the U.S.–Israel relationship will score higher than 5 for a specific metric, and hence, can obtain an aggregate score above 100. Exhibit 6, right, compares the 2013 Index with the top-level results of two other indexing projects which measure innovative activities on a national basis. 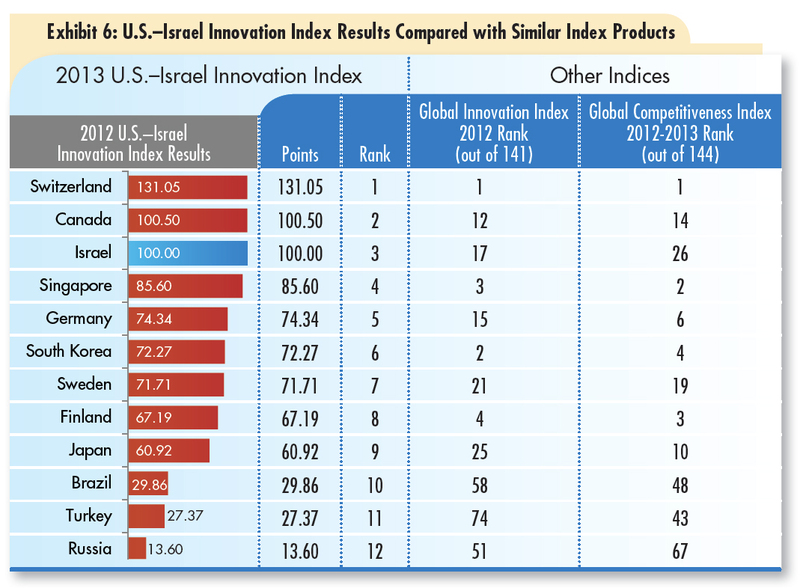 Although these other two indices do not measure linkages between countries, it is expected that top performers in the U.S.–Israel Innovation Index would also perform well in these other comparisons. Indeed, Exhibit 6 shows that the top (and bottom) performers in the Index, generally place in similar ranking ranges in the other two comparator indices.